Congratulations for all of your hard work, advocates! 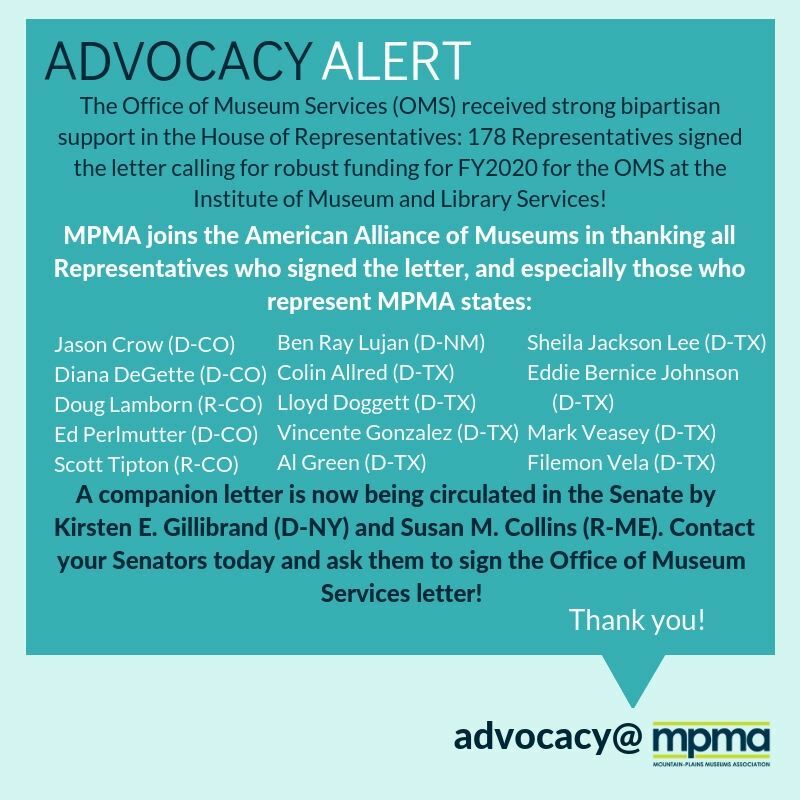 Please take a moment to thank your Representative who signed the letter, and ask your Senators to sign the companion letter supporting the Office of Museum Services, which is now being circulated. You can find their contact info here: https://www.govtrack.us. Make sure your voice is heard on issues affecting museums. Contact your elected officials through the link below. MPMA staff and board members attend Museum Advocacy Day each year. MPMA advocates for members at the regional and national level and represents the region at the AAM Council of Regional Associations (CRA). The CRA discusses and advises AAM on trends and issues from around the nation. MPMA members are encouraged to inform MPMA staff and board members about issues and trends from the field so they can be conveyed to this national body. Members are also encouraged to alert MPMA to any situation that may require helping public officials understand the beneficial role of museums in a local community or state. Do you have an issue you need help with? How To Guide: This is a step-by-step guide for making appointments and discussing issues. The annual Museums Advocacy Day takes place over two days, February 25-26, 2019, at the U.S. Capitol in Washington, D.C. Advocates from around the country are given issue briefings, political updates, and training on how to set up meetings with elected officials and successfully discuss matters of importance to the field. The American Alliance of Museums (AAM) hosts Advocacy Day and arranges all appointments in D.C.